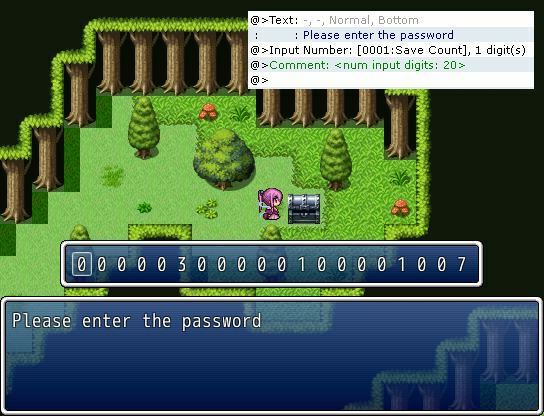 This script allows you to set more digits for your number input event command. By default, the event editor only supports up to 8 digits. Where `x` is the number of digits you would like. See the screenshot above for an example. Would it be possible to make an input digit which only accepts certain numbers? Let’s say I want to make an event which asks for a binary number, so it would only accept zeros and ones. Another would only accept octal digits and stop at 7 before returning to 0. This would be very useful because I don’t want to make a “please enter a valid number” message. You can use the Symbol Dial System that allows you to specify which symbols will be shown (eg: 0 through 7). You may not need to use this script since that script automatically determines how many digits is needed depending on how your event is set up. Thanks! Didn’t know that other script existed. You’re awesome!